I like using Priceline.com for booking hotels. It’s an “opaque” auction site where you bid for a room by minimum star rating, city and district. You don’t find out the name of the hotel until you submit a wining bid. I’ve found some great deals over the years using Priceline, the LA Omni for $50/night and both the Hyatt Regency and Marriott Pinnacle in Vancouver, BC for $60/night. Of course you don’t usually get such a good price, but I find I can be consistently get a room for 20% less than the best online price. Priceline also has bidding for flights and car rentals although I’ve never had much luck with either of those. But for hotels it’s hard to beat. There are a lot of tricks to getting the best price from Priceline. I highly recommend that you study the information on BiddingForTravel, a message board for Priceline users, before you place your first bid. Priceline has taken a rather tentative step into the mobile web at priceline.mobi. Strangely, it’s missing what Priceline is best known for – bidding for heavily discounted flights, car rentals and lodging. 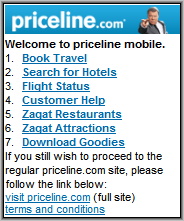 There are links to Zagat and a few airline mobile flight status pages, but the only thing you can do on Priceline Mobile is search for available hotel rooms. You enter a destination city or airport code and the dates you wish to book and receive a list of available properties with prices and star ratings. To book a room you have call Priceline using a click to call link. The prices don’t seem to be special, being similar to other booking sites like Travelocity. The mobile site isn’t very robust either, searches frequently return an error saying “Sorry. Your browser didn’t understand where you were trying to go”. Retrying usually works though. Lodging is such a natural for mobile but I’ve yet to find a single mobile hotel booking site that is very good. All I really want to be able to do is bring up a list of all available nearby rooms with prices and click to call numbers. However, all the mobile booking sites seem to have a fatal flaw. Either they only cover one chain, don’t work on the majority of browsers, have horrible usability issues or the price and availability information is missing or wrong. Why is that? This entry was posted in Hotels and tagged Hotels, mobile site review, Priceline by Dennis Bournique. Bookmark the permalink.